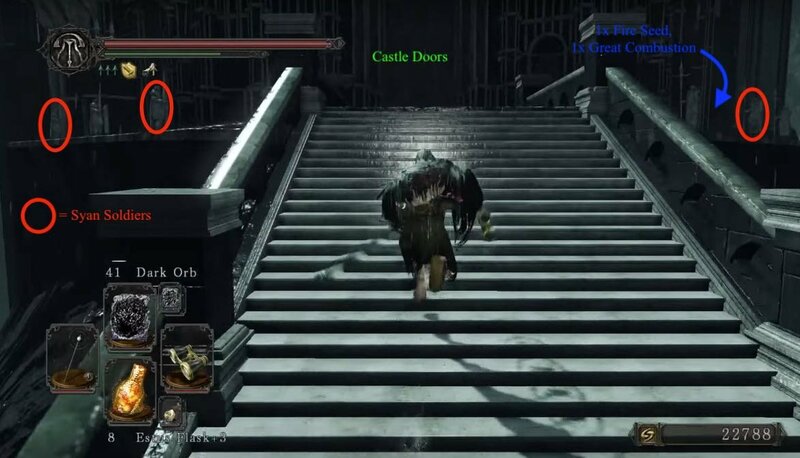 The skeleton beneath the stairwell right after you proceed through the progress golem door has Great Magic Barrier in NG+ instead of 3x Old Radiant Lifegem, 1x Monastery Charm, and 1x Soul of a Hero. 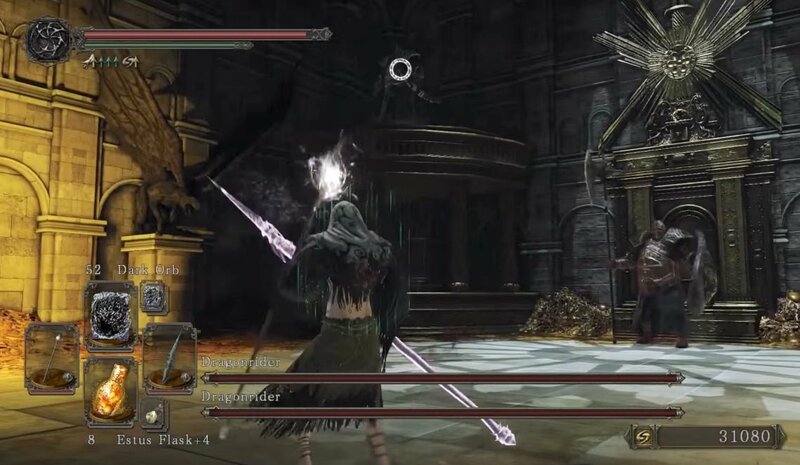 Black Phantom spawns in the room with 'the Embedded' in NG+ or if you burnt Bonfire Ascetic in King's Passage bonfire, he respawns as he's not invader. The Castle is reached after defeating and acquiring the souls the 4 Bosses: The Old Iron King in Iron Keep, The Rotten in Black Gulch, The Lost Sinner in Sinner's Rise, and Duke's Dear Freja in Brightstone Cove Tseldora. Alternatively, the door can be opened by acquiring sufficient Soul Memory, that vary according to your NG status -click here for more details. From the Ruined Fork Road Bonfire in the Shaded Woods, head up the stairs to find three doorways. Out the left doorway, you'll find a path riddled with Falconers that lead down a slope until you reach a Forest Grotesque, a Ghost, a door arch blocked by rubble. Look left for a stone path, and you will enter the Shrine of Winter. If you have all four souls/sufficient Soul Memory, the Black Gate will open you can proceed through the other doorway, and down the path to take you to the Castle. On your way, when you come down the zig-zag slope, head right to pick up a Soul of a Hero, then continue left. You will shortly come across a Divine Blessing, and a couple of Ghosts. Continue down the path to find a corpse on a small wall on the right, containing a Large Soul of a Nameless Soldier, and a Human Effigy. Shortly after, you'll find the entrance to a tunnel that lead to stairs. Eventually, you'll reach the outdoors. Proceed forward and you will reach a long spiral staircase, atop of which you will find three Royal Swordsmen on your left. Proceed up the next set of stairs, making sure to check a boulder on the right for 2x Holy Water Urn. Walk a little further to be prompted with the title, signifying your entry to the Castle. Immediately after seeing the 'Drangleic Castle' title prompt, you'll find a Crystal Lizard on the stairs. At the first archway, the Emerald Herald from Majula will be there to allow you to exhaust her limited dialogue. If you continue up the stairs, you'll come across two Primal Knight statues; they will attack when you get too close, so get the jump on them, before they do on you. Once you make it to the castle doors, you will be attacked by a total of five Royal Swordsmen. If you stray to the right, one of the Syan Soldier Statues will come to life and join in the attack; if you stray to the left, two of the three here will also reanimate. This can get tricky to deal with, however the big open space can play well into your hands. Once they've been dealt with, search the right side of the building to find a chest containing a Fire Seed and Great Combustion, then into the doors to enter the castle. 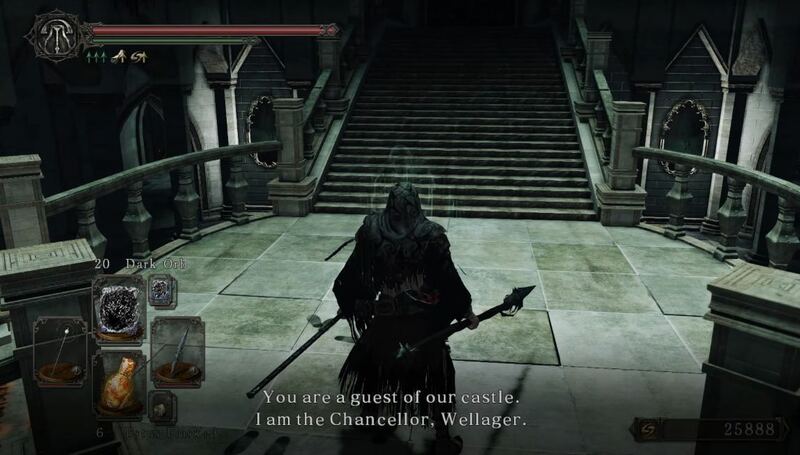 Once inside talk to the invisible NPC, Wellager, on the staircase. After exhausting his dialogue options and learning about the King and Queen, he will become a merchant. After speaking with him, head down the left stairwell (facing the entrance). Once you enter the hallway on your left, a Syan Soldier guarding a door, containing a chest with a Sublime Bone Dust. Continue down the hallway, baiting the Syan Soldier statues to come alive, and killing any that do; including the one you killed first, here should be a of four statues that come to life in this particular hallway. Open the door at the end, and before you head down the ladder, one of the two "statues" is actually a Royal Swordsman. Down the ladder will be two sets of pale blue doors. Open both to find the King's Gate bonfire. From the bonfire there will be two paths, left and right. Since you need a Key item to go left, you should go right instead. You will enter a room with several Stone Soldiers. Some in pairs in front of Golem doors that you have to feed a soul in order to open, just like how you entered the castle. All the Golem doors in this room house a Ruin Sentinel. At the back of the room are two Golems that will light torches if you feed them a soul. Once the golems/golem doors are fed, they need not be again. Nothing to collect from the first room. 1x Pharros' Lockstone in the middle room. The last room on this side hides a hole leading to a darkdweller guarding the Faraam Set. 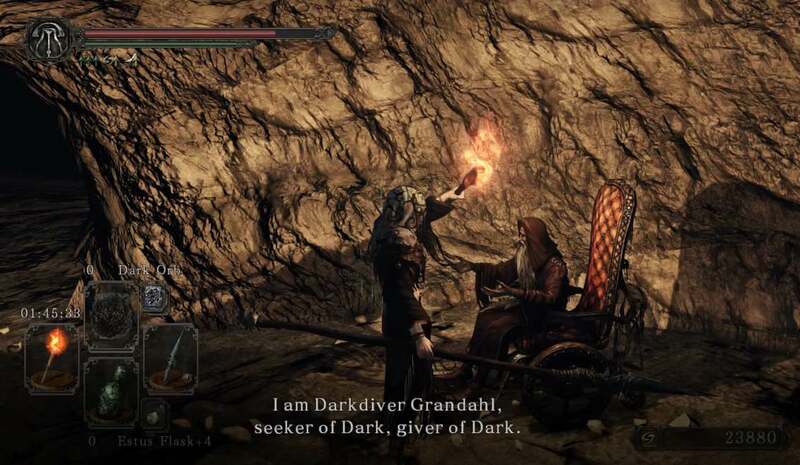 If you take the tunnel on the left from down here, you may find Darkdiver Grandahl. If this is the third time see him, you will be able to enter his Covenant 'the Pilgrims of the Dark'. Make your way to the other tunnel to the Under Castle Drangleic bonfire. For progress, enter the first room. Claim a Mastodon Greatsword from the middle room. The Royal Soldier's Ring +1 can be obtained from the last room on this side. These Ruin Sentinels and the Stone Soldiers respawn, making this room a constant danger, if you open all of the Golem doors to get the items. 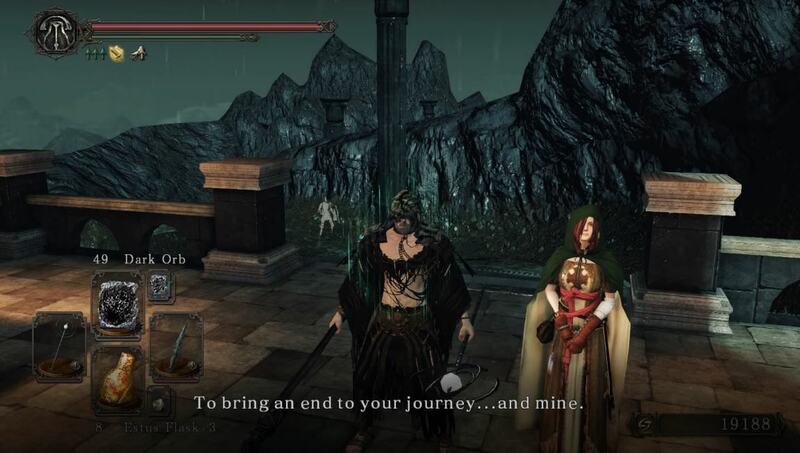 While a danger, this also presents an opportunity to farm since they spawn infinitely and Stone Soldiers have a rare chance of dropping Titanite Slabs,. A good way of dealing with the Ruin Sentinels is to take them back to where the bonfire is, and keep them in that corridor. They won't attack you, but they will keep their shield up. It's slow to kill them, but it's much safer. You just have to stand in front of them while they try to walk back to the big open area. You can pull them towards that corridor so they start walking back, then moving towards them to make them attack. All of these attacks are guardable with a 100% physical resistance shield, and easily evaded by rolling. After they've attacked, you've got time to get one or two attacks or spells in while they don't have their shields up. As soon as their attack animation is complete, they'll raise their shield and ease out of the corridor, allowing you to rinse and repeat until they're finished. Try using poison arrows. 5-6 hits on a Sentinel are required to trigger the poison effect. You can also use Poison Mist and Toxic Mist through walls to poison them. They give some decent souls and can also drop their armor, so this area is pretty much ideal for farming, but only in NG, as they don't respawn in more advanced playthroughs. Once you pass through the Golem door, head up the stairs to find the first item in the room, the Frozen Flower. On the left is a chest with 15x Dark Arrows, and after going up the stairs you can grab the 3x Old Radiant Lifegem, a Monastery Charm, and a Soul of a Hero from the skeleton beneath the stairwell. One of the statues here will come alive as well.You eventually come to a room with corrosive acid covering the floors and contraptions shaped like dragons spitting even more acid at you. It does not affect HP but will destroy your armour quite quickly. Be sure to remove all your gear if you want to play around in the acid. In here you will find a chest containing 3x Corrosive Urn and a dead body holding an Elizabeth Mushroom. Move up to the platform with the statues, then proceed to the stairs. Ascend to the next area and you will come across a door to a room filled with masks. 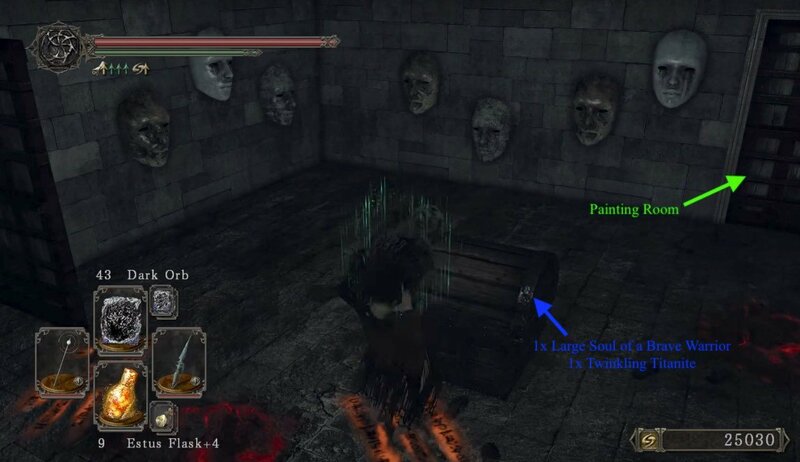 A chest in this room holds 1 Large Soul of a Brave Warrior and a Twinkling Titanite. The masks all shoot arrows at you from all directions, so stand still and let the first shot shoot, then dash for the door. The next room has three Syan Soldiers statues that all come to life, with and a large painting -so easy to avoid, just don't walk in front of it. After dealing with the Syan Soldiers pick up the loot that they were guarding which is in total, 10x Fire Greatarrow and 10x Destructive Greatarrow, 3x Torch, and a Petrified Dragon Bone. Exiting this area via the door and up some stairs, will lead you outside to some more stairs. You'll encounter two Royal Swordsmen to begin with, shooting arrows at you, and then a Syan Soldier. Look for a ladder here and it down, and if you didn't kill them already, there will be another Royal Soldier waiting for you here guarding a corpse with a Soul of a Brave Warrior. Examine the middle wall here; press the "use" button on your controller to reveal an illusory wall that opens to the Forgotten Chamber bonfire. This is a good time to rest because of the upcoming boss fight. Another ladder directly in front of the bonfire wall take you down to a chest containing Hunter's Blackbow and 20x Iron Arrows, and another Royal Soldier. After opening the chest, climb back up the ladder and continue along the path you enter a room with the Queen seated at the far end. Talk to her, exit through the side, and get ready for a boss battle. 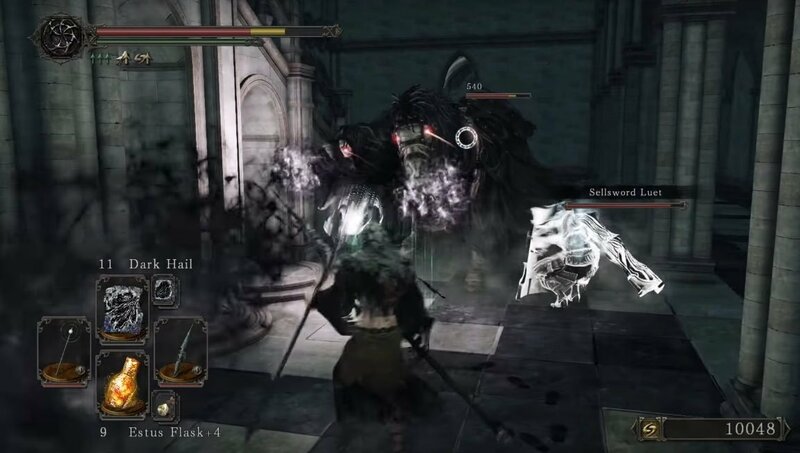 After this fight, move right to the next area you will arrive at the Central Drangleic Castle bonfire. From here, head down the stairs. There are 3 paths to take, two of which are unavailable. One is the iron door "King's Passage" and the second is an elevator that has yet to drop down that will cover the big hole in the floor. 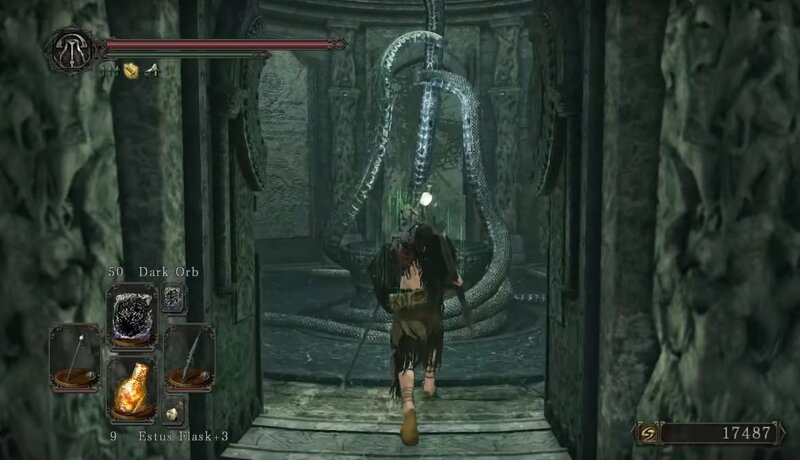 So take the only route you can, the lengthy ladder to room with another Golem that needs to be activated by souls again. Surprisingly, none of these statues come to life here so you must lure one of the two headless hollows from the next room, to sacrifice their souls. This makes the Golem activate the elevator from earlier. In the room you lured the hollows from, are two iron chests : one contains the Old Knight Hammer, and the other one Caitha's Chime and the Soul Greatsword. This room also has a summon sign for Sellsword Luet. The next room has is a big staircase, and an Executioner's Charriot that drops Gower's Ring of Protection. At the top of the staircase, an Old Knight with a hammer will attack you. There's an Old Knight guarding a chest on each side at the top as well. The chest on the right contains the Pyromancy spell, Fire Storm. While the chest on the left isn't actually a chest, it's a mimic chest containing a Petrified Dragon Bone and a Washing Pole. Head back down the stairs and out the doors to find yourself back outside. On the right, you will see a blue door, and right next to it, a path going down. 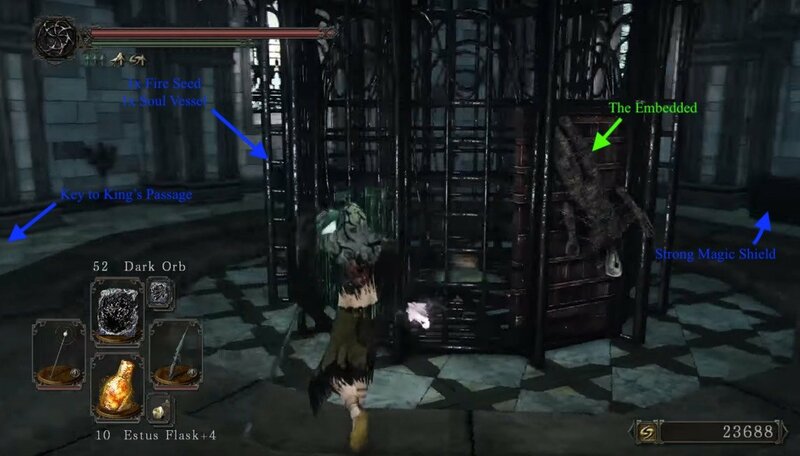 The door doesn't open, but there is a ladder next to it which you can use to climb, and kill the Gargoyle and Alonne Archer. Head back down the ladder and go through the small brown door at the bottom of the stair, to two Desert Sorceresses, 5x Repair Power, and 10x Flame Butterfly. The chest near the ballista also holds a Estus Flask Shard. Now pull the lever near the gate and it will open. Open the door and make your way down the stairs to the previous Central Drangleic Castle bonfire. From here head to the room that had the locked door and giant hole in the floor. It will now have an elevator, the Golem you fed earlier did that for you. You can now take it up via pressure switch when you stand in the middle of it. You can also now call it down by pulling the lever right next to it. Once at the top there will be a caged cell with an unlucky woman in it and an even more unlucky hollow, chained and bound to it upside down. His side-story can be found here: The Embedded. There are 3 chests in here one has the Key to King's Passage, another contains a Fire Seed and Soul Vessel, and the last one holds the Strong Magic Shield . Last but not least there's a hidden Hollow on the bars opposite of The Embedded. Just attack the bars and he'll drop a Small Smooth & Silky Stone. Take the elevator back down and use the Key to King's Passage to open the previously looked big doors.